Protect Wisconsin Waterways representatives and volunteers attended part of one day of the Festival on the Rock in coordination with our Protect Wisconsin Waterways Sweep event across the area. 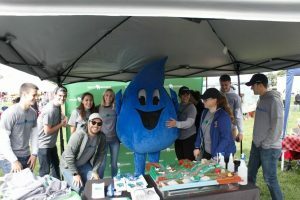 The volunteers talked with festival attendees about the mission of Protect Wisconsin Waterways, distributed t-shirts, and used the Enviroscape for demonstrations. We also helped pick up trash at the event which was held along the Rock River at Preservation Park in Beloit. Our team talked with families and community members about the importance of keeping pollutants out of our waterways. 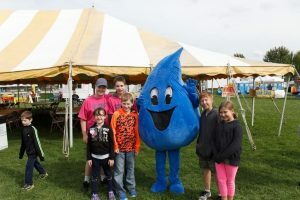 In addition, our mascot Splash made an appearance to meet and interact with festival attendees and to take pictures with kids. Splash also jumped on some of the carnival rides and was featured in Beloit news outlets increasing the overall exposure at this event.